Over 30 exhibits where on display for Hereford judge and breeder Tony Bradstock at Saturday’s Calf Fair at Balmoral with two Co Down breeder’s taking the top spots. 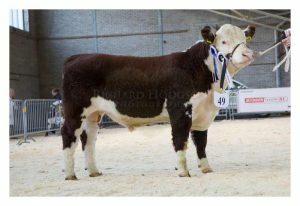 Senior Champion was taken by Bertie and Greer Watson with their home bred bull Barnburn 1 Napolean. 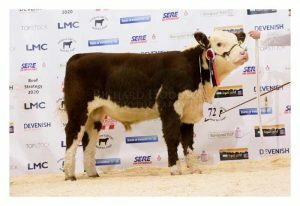 Sired by the National show champion Pinmoor 1 Kingsley he certainly is following in his fathers footsteps. 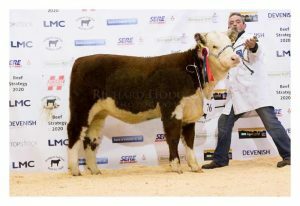 Reserve Senior Champion was won by Solpoll 1 Nobility owned and bred by J&W McMordie, a son of the prolific Panmure 1 Henry. 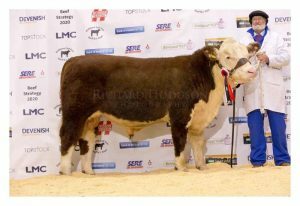 Junior Champion was won by John and William McMordie with an April born Bull Solpoll 1 National with reserve taken by a heifer Lisrace Crystal belonging to David Wilson.